While the home squad was battling Yu Darvish and the media frenzy that accompanied him in Peoria, half of the Padres were in Goodyear to take on the Reds yesterday. Led by starter Cory Luebke, the Friars tossed a three-hit shutout, striking out 13 over the course of the afternoon. Luebke paved the way, striking out four while allowing one hit and one walk over his 2.0 frames. Casey Kelly followed with 2.0 perfect innings and two strikeouts of his own. Relievers Andrew Cashner, Dale Thayer, Matt Palmer, Erik Hamren and Brad Brach shutout the Reds over the final 5.0 frames, striking out seven. Brach put on a show in the ninth, striking out the side to close out the game. After yesterday’s games, the Padres have now struck out 39 in 43.0 innings of work, averaging 8.2 strikeouts per 9.0 innings pitched. 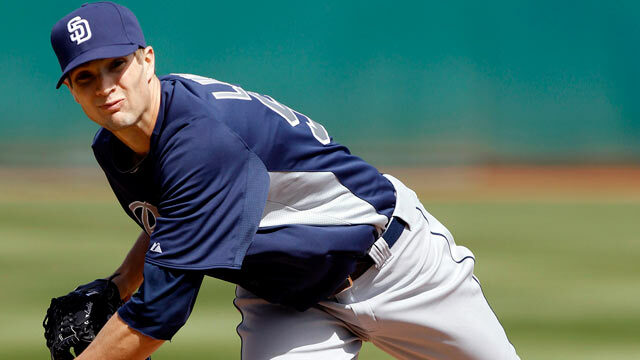 San Diego’s relievers are averaging a strikeout per inning with 33 in their 33.0 innings this Spring. Yesterday was a big day for the Padres as they agreed to terms with three of their top draft selections on the final day of signing. As is customary with the early picks from each year, it came down to the last minute and the Padres landed a bevy of talent to add to their minor league system. The club yesterday signed right-handed pitcher Joe Ross, selected in the first round, right-handed pitcher Michael Kelly, selected in the compensation round and catcher Austin Hedges, selected in the second round. Check out this post from June with some video of both Kelly and Hedges. When all the dust settled, the Padres signed 26 of their top 27 picks from this year’s draft. Ross, 18, was selected 25th overall in the first round by the Padres. The right-hander was selected out of Bishop O’Dowd High School in Oakland, Calif., where he posted a 0.83 ERA and 95 strikeouts over 67.2 innings during his senior campaign. Kelly, 18, was selected 48th overall in the compensation round (for right-handed pitcher Jon Garland). He was selected out of West Boca Community High School (FL). The right-hander played in the 2010 Aflac All-American Baseball Classic at PETCO Park. Hedges, 18, was the Padres’ second-round selection out of Junipero Serra High School in San Juan Capistrano, Calif. The right-handed hitter was rated as the 12th-best position player prospect in the 2011 draft class by Baseball America, as well as one of the best defensive catchers.